Diurnal Temperature Range and why it contradicts Alarmism. greater global warming at night and during winter is more typical of increased greenhouse gases, rather than an increase in solar radiation. So, is this true that the rate of warming is greater at night and during the winter with the result the minimum temperatures are increasing faster than the maximum temperatures? Not at any level. 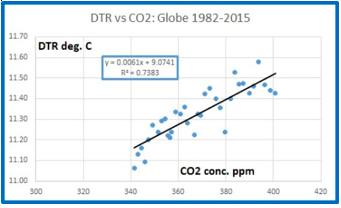 Ken Stewart shows that DTR is not decreasing and in fact since 1982 has been increasing consistent with an increase in CO2! This is a profound contradiction of AGW. If CO2 were the cause of AGW as the alarmists claim and if decreasing DTR is a basic marker of AGW then logically an increase in CO2 must cause a decrease in CO2. The opposite is happening. Another researcher Chris Gillham has prepared some interesting graphs that show rather than CO2 and AGW being the main factor in DTR it is rainfall. 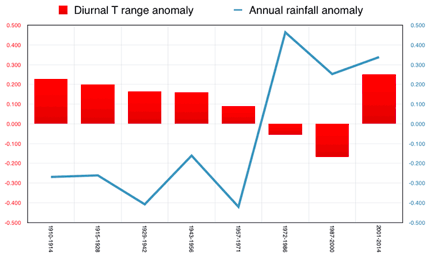 The top chart illustrates that the above or below average dichotomy between DTR and rainfall is precise year by year since 1910, with almost every year showing above average rainfall equals below average DTR, and vice-versa. 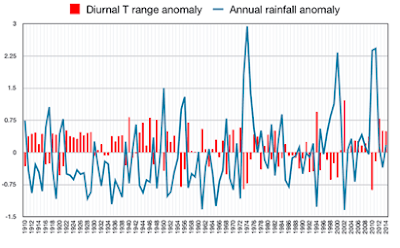 Until 2001, when both above average rainfall and DTR start occurring, despite being slightly masked by some of the driest and wettest years on record triggering appropriate diurnal shifts in those years. 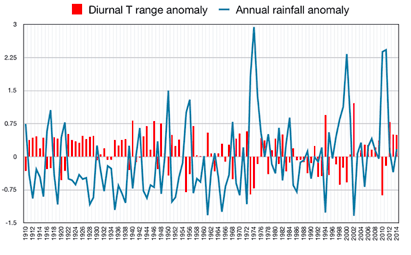 The second chart breaks the ACORN record into 14 year blocks and better illustrates the changed relationship between rainfall and DTR. Well above average rainfall in 2001-2014 should logically mean cooler average daytime max and warmer overnight minima, thus a reduced and normally below average DTR. The illogical opposite happens, with the 2000-2014 DTR average instead the highest since 1910. Of course in a reasonable world people like Braganza would be taken to task for their misleading information. However, in the world of alarmism up is down and frankly people make stuff up and never retract their mistakes. And in the meantime our witless government and our even more witless opposition introduce and propose ever more expensive solutions to a problem which does not exist.